✨ More frequent candidate submissions. 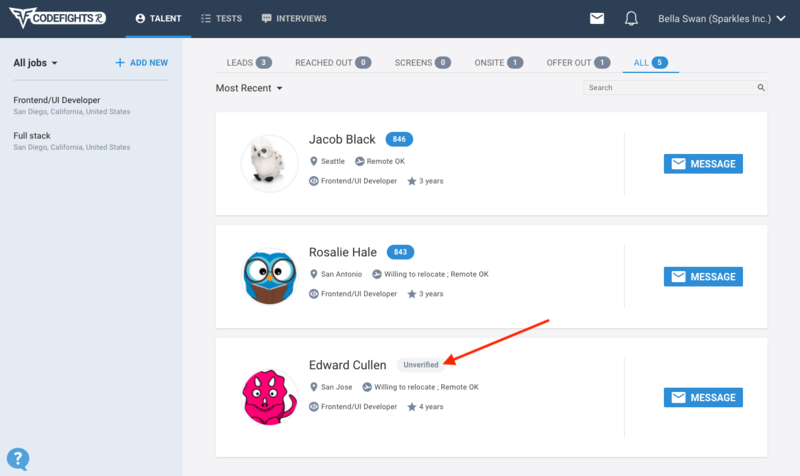 Unverified candidates are a new category of high-potential candidates on your Talent dashboard, giving you access to even more technical talent! Unverified candidates have not had enough activity on the CodeSignal platform to have been assigned a talent score, but there are other indicators in their profile that suggest they'll be a good fit for your open roles. These indicators include things like a strong work history, educational background, and more. These candidates profiles will be displayed in your Talent tab. Since the system prioritizes candidates with verified skills, they will show up at the bottom of your list of candidates. We want to make sure that you're getting access to new candidates on CodeSignal as soon as their profiles go live on our platform! That way, you won't miss out on the chance to reach out to someone who'd be perfect for one of your open roles. To that end, we have started adding new candidates to your Talent dashboard three times each week: Monday, Wednesday, and Friday.